However you display them, it’s easy to say YES! to decorating with table runners—that you make yourself! Using a runner to brighten up any space is a simple task. And since runners run around a quarter of the size of an average throw quilt, you know that sewing speed is built in. Clockwise from top left: Wisteria Lane by Melinda Bula; Rhubarb Crisp Runner by Jo Morton; Rungs by Karla Alexander; Starry Night by Karen Costello Soltys, Las Hojas del Otoño (Autumn Leaves) by Jane Dávila; An American in Paris by Joanna Figueroa. Want more runner patterns from popular designers? 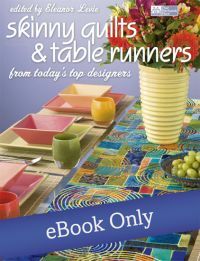 Get the book that started the “skinny” series: Skinny Quilts and Table Runners! Try out a new technique or style without committing to a lot of time or fabric. 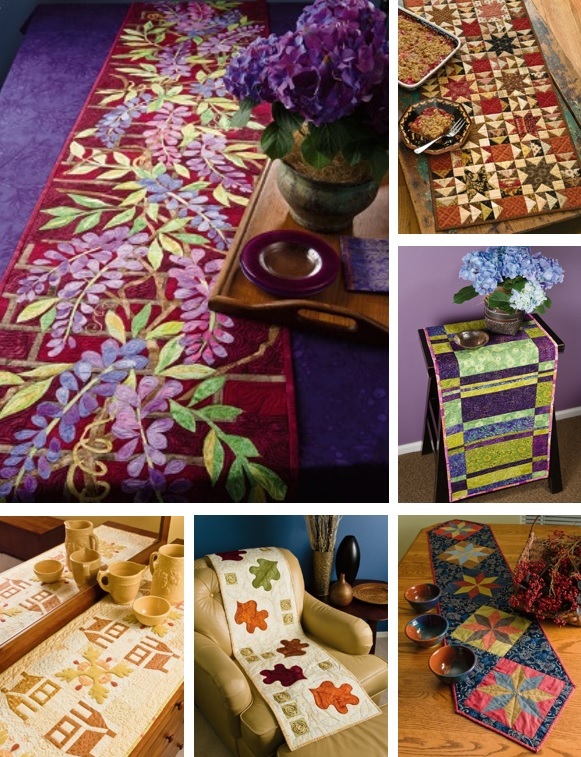 You’ll find designs from Kaffe Fassett, Jane Sassaman, Marti Michell, and many more. What spot needs a “skinny” spruce up in your home: a skinny wall, a skinny shelf, a skinny table top? Tell us in the comments! We have a long table at our cabin at the lake that is the gathering spot for everyone since the kitchen opens on to the dining area. 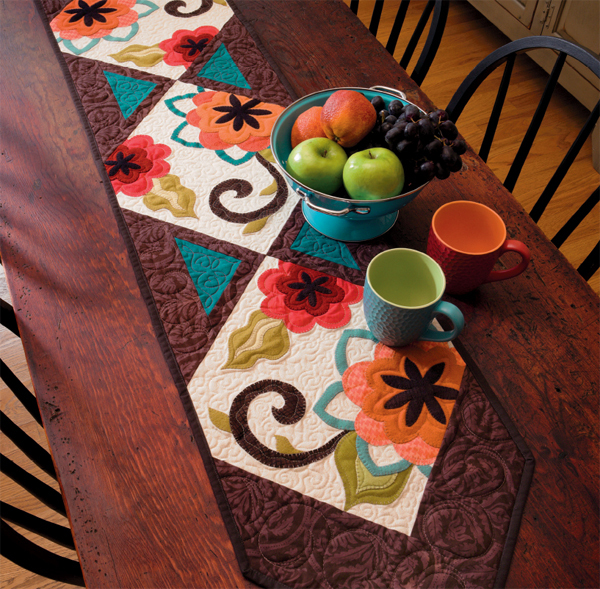 The dark wood is the perfect background for a colorful table runner. Our long table at the lake is the perfect background for a table runner or colorful placemats. The back of the toilet! A wall space in the bathroom. On the outside of my apt. door. Above the door frames. I LOVE TO DRESS UP THE TINY DRESSER I USE IN MY GUEST BATHROOM. I HAVE ALWAYS THOUGHT OF IT AS A SPOT TO SHOWCASE A LITTLE OF MY HANDIWORK. I need a skinny table runner to go on my piano and my organ. There is nothing there right now but they would be great places to put one. Skinny would fit perfect! These runners are lovely, and I love having not only several to use on my table, but they make great gifts. I need a long skinny quilt to go over an oak rocking chair. I also think these runners would make fabulous gifts for my friends who aren’t in need of a full-size quilt. I use them for table runners, and for putting on my dining room sideboard. These little quilts are terrific! There is always a place in our home for any quilt. I like to hang long narrow quilts on the doors in our home. They brighten up the hallways when the doors are closed and "decorate" the rooms when the doors are open. Thanks for the possible opportunity. I need more skinny quilts for my coffee table, just love them. I need variety. The fire mantle, old radio china cabinet. The fireplace mantel, in a winter theme. I love table toppers….I think because I look at them more often than something on the wall. A lot of places in my home could use a skinny table runner; however, I spy a small table in my entrance that could really use a picker upper! I do have some skinny walls,,, but the one that caught my eye is the one that hangs over the front of the little table. That would hide the magazines, catalogues, newspapers that accumulate, wouldn’t it?!!! Maybe the purples were part of the reason it caught me eye too!